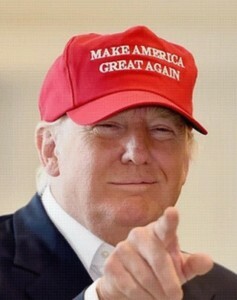 ‘Make America Great Again’, Donald Trump’s slogan, has many ancestors. I found another insurgent candidate with resonant mottos in Guy de la Bedoyere’s wonderful The Real Lives of Roman Britain (Yale Univ. Press, 2015). Carausius was the insurgent’s name. He’d served with distinction on land and sea on the Roman empire’s northwestern frontier. In 286, he tried to make himself the western Caesar (a junior emperor in Diocletian’s Tetrarchy) from a base in Britain and Belgium. He set up a court and acted like a Caesar. …Carausius, or at any rate someone on his staff, was well read. The coins [he issued] include many literary allusions but none more so than in the cryptic … legend that appears on many of the silver coins: RSR. This was short for Redeunt Saturnia Regna, ‘The Golden Age is back’, from Virgil’s Fourth Ecologue. If that was not enough, he issued medallions, one of which repeats the RSR and the other of which has INPCDA, the next line of the Fourth Ecologue. It expands to Iam Nova Progenies Caelo Demittitur Alto, ‘Now a new generation is let down from heaven above.’ Such extravagant claims make the silver type he issued with a legend Expectate Veni, ‘Oh, come the awaited one’, adapted from Virgil’s Aeneid, all the easier to understand. 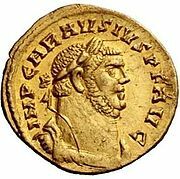 Like most emperors and pretenders in the horrible 3rd century (roughly, from Commodus’s assassination in 192 to Diocletian’s emergence over a pile of imperial bodies in the early 290s), Carausius’s reign ended with his assassination in 293 – by his financial officer, of all people. The messenger shot the recipient? The irony is that after a lot of bloodshed Diocletian and the Tetrarchy put the Empire to rights. And, in Carausius’s former domains, there was a gilded, if not golden, age in the 4th century. Rather like ours. The magnificent English villas, improved and enlarged over the century ending in 410 (when Rome officially abandoned Britain), testify to a supremely wealthy elite. The buried hoards of plate and coins that have turned up in fields and forests for a thousand years bespeak its end in the decades immediately thereafter. For some thoughts on the end of Roman Britain, see my post on A Canticle for Leibowitz. Guy de la Bedoyere, The Real Lives of Roman Britain (New Haven: Yale Univ. Press, 2015), pp. 152-54. On which, more anon. Pat Southern, The Roman Empire: From Severus to Constantine (London: Routledge, 2001), 149. An exceptionally well-written survey of the third century with notes that almost constitute a book in themselves.